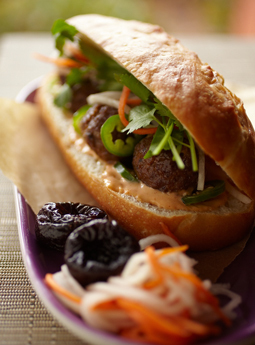 Banh Mi Sandwich with Turkey Meatballs - A recipe from Savor California, the online showcase for extraordinary gourmet foods and beverages from California. Cut rolls in half horizontally and remove some of the crumb to make room for the filling. For each sandwich, spread a thin layer of mayonnaise on insides of 1 roll. In bottom half of roll, layer a few slices of jalapeño, 4 meatballs, 4 sprigs cilantro and 2 tablespoons pickles. Cover with top half of roll. **To make carrot and daikon pickles, place 1/2 cup julienned carrots and 1/2 cup julienned daikon in a nonreactive bowl. In a small saucepan, heat 1/4 cup rice vinegar, 2 tablespoons sugar and 1 teaspoon kosher salt just until sugar dissolves. Cool to room temperature and pour over carrots and daikon. Let stand at room temperature for 1 hour or refrigerate, covered, overnight. Drain before using.